Monday morning I walked into work with three bags full of fresh, homemade bagels. I sent around an e-mail to my coworkers and they came by for breakfast. People limiting themselves to a half bagel soon came back for the second half. Some showed up later in the day for a second bagel, wanting to try each of the flavors that I brought in. I don't know whether it was the draw of a homemade treat or that never-dying grad student mentality. For those of you that don't understand the "grad student mentality," let me explain. 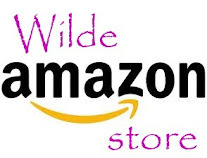 Grad students live on a small income and love free stuff. Any free stuff. By the time you hear that there is free food in the building, it's already gone. Grad students are like little piranhas. After five years of perfecting this skill, it never goes away. Former grad students will always find the best free stuff, make friends with them! Of course I'd like to think that it was the bagels that brought people back for seconds. This past weekend I spent half a day prepping, kneading, rising, boiling and baking two batches of bagels. I decided upon two different recipes, one requiring oil and one a simple dough. Both recipes required quite a bit of hands on time and a lot of flour! 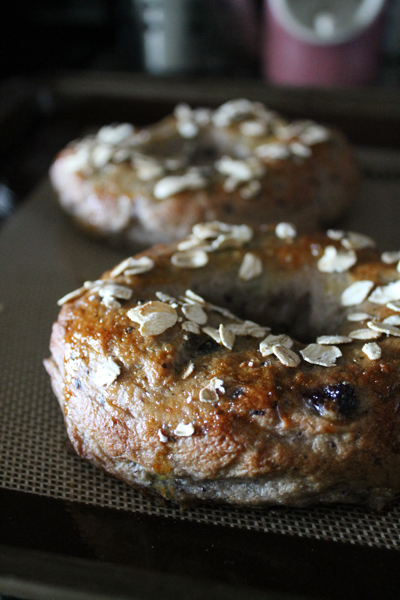 Today I'm sharing the recipe for my blueberry-oatmeal bagels with you (tomorrow we'll have some cherry-coconut beauties). These were the favorite of my two weekend endeavours. 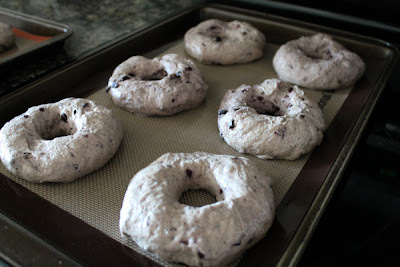 Beginning with a traditional bagel recipe, I swapped out some of the bread flour with oat flour. Once the dough came together I poured in a pouch of dried blueberries, they turned the dough a beautiful color. After a short rise period, the bagels were boiled for a short time in slightly sugared water. 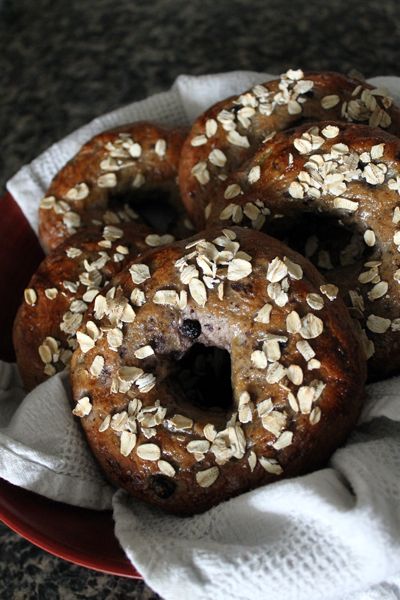 A nice egg-wash and sprinkling of rolled oats and the bagels went into the oven. Within a few minutes, the apartment was filled with the sweet smells of yeasty bread. The first batch of bagels wasn't ready until around noon, but that didn't stop me from having one for lunch! Now the big question, was all the time invested worth the final product? No doubt about it, yes. Store-bought bagels, even some deli-bought bagels, tend to be too tough on the outside and too huge for a normal person. Making your own bagels at home gives you the option to change the flavor, size and texture of the bagels. And really, nothing beats a house that smells like freshly baked bread. It's a bonus. I decided to change up the original recipe with some oat flour. 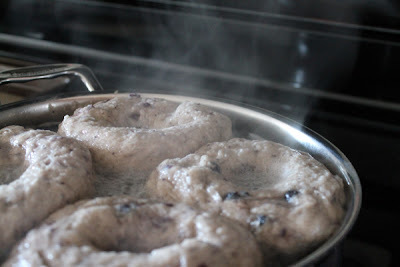 Be sure not to swap out all of the bread flour with another flour because you need it to develop the gluten in these bagels. 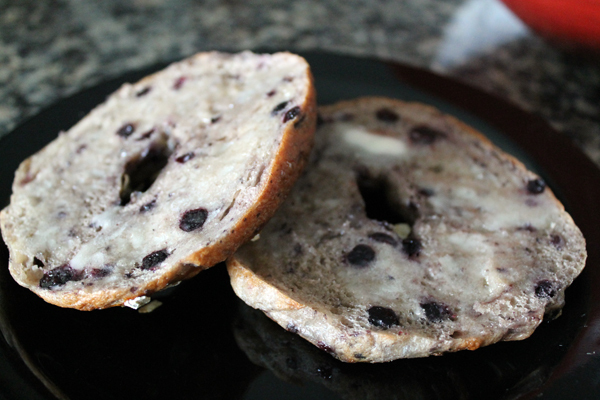 Be sure to use dried blueberries, they will rehydrate during the process of making these bagels. There are also a wide variety of dried fruits out on the market now, so feel free to change it up! Mango, apricot, cranberry, your choices are only limited to your grocery stores supply! Combine the first 6 ingredients in a large bowl, or bowl of your stand mixer, and mix. Knead for about 10 minutes. Add dried blueberries and knead for 5 more minutes. The dough should be stiff and smack the sides of the bowl. Coat a large bowl with cooking spray and add dough. Roll the dough ball around to coat it in oil. Loosely cover with plastic wrap and let the dough sit in a warm place for about 1 hour. The dough should be roughly doubled in size. 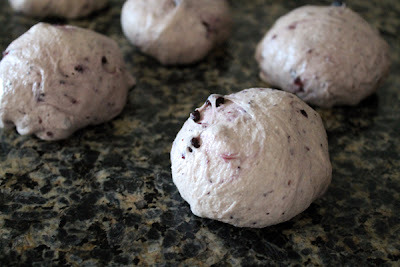 Grease your work surface with cooking spray and turn dough ball out onto the surface. 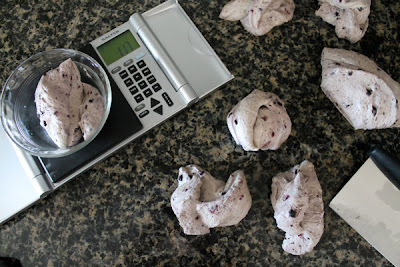 Divide the dough into 8 equals portions (I used my kitchen scale to weigh out equal lumps of dough). Roll each lump into a ball and loosely cover the balls with plastic wrap. Allow the ball to rise for 30 minutes. In a wide, shallow pan, combine water with the sugars. Bring to a boil then reduce to a simmer. Preheat oven to 425. To shape the bagels, poke a hole in the middle of each dough ball. 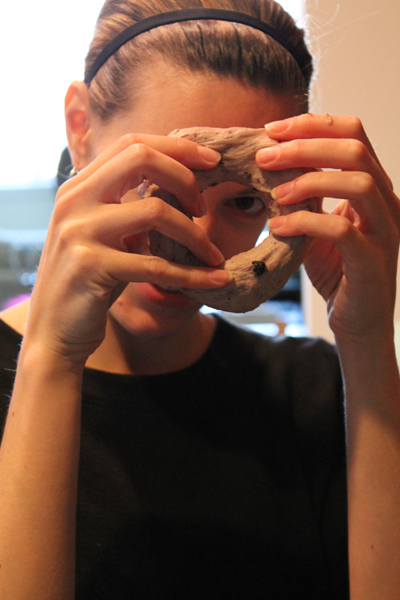 Twirl the dough around the index fingers of your two hands until the hole stretches to about 2 inches. Place the newly formed bagel on a parchment or silpat covered baking sheet. Shape the remaining dough balls. Drop the bagels, 3-4 at a time, into the simmering water. Boil the bagels for 2 minutes and flip over to boil for another minute. Remove from the water bath with a skimmer/strainer and let cool for a few minutes on the parchment-lined baking sheet. Whisk together egg and water, brush each bagel with the egg wash and sprinkle with rolled oats. Bake the bagels for 20-25 minutes, or until your bagels are golden brown. Remove from the oven and allow to cool on a rack.